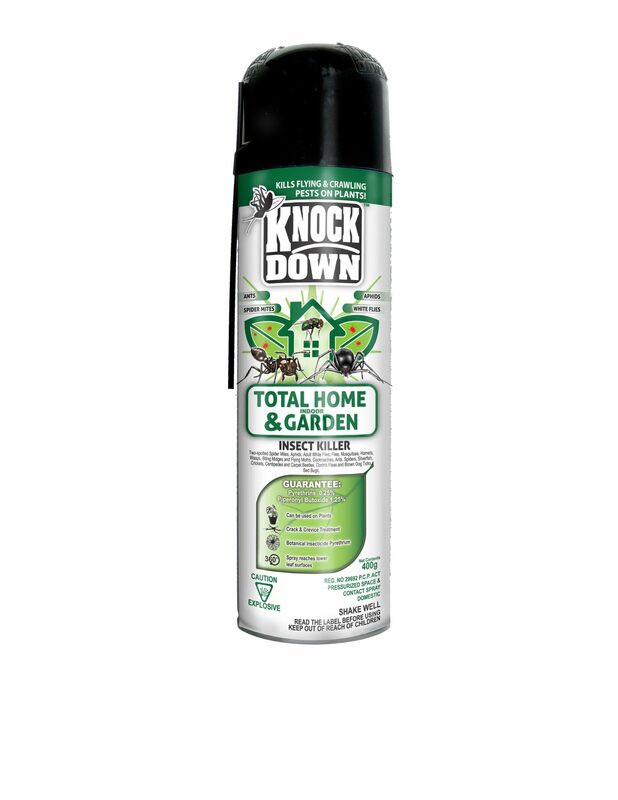 KD118D – KNOCK DOWN – TOTAL HOME & INDOOR GARDEN – KUUS Inc.
*Do not use this spray more than once a week. * except for Pests on ornamental plants – can be sprayed as necessary. DIRECTIONS: Use ONLY in well-ventilated areas. SHAKE WELL BEFORE USING. Hold can upright at least 120 cm from all objects and aim nozzle away from person. Press button firmly to spray. Do NOT use this spray more than once a week. Treatment must only be repeated if the pest problem persists or reoccurs. TO KILL INDOOR PESTS: Flying Insects: Flies, Mosquitoes, Hornets, Wasps, Biting Midges and Flying Moths. Close doors and windows. Direct mist upwards in circular sweeping motion to all parts of the room especially windows and other light sources. Apply 6-10 seconds burst per 30m3 of space. Whenever possible, keep doors and windows closed for 15 minutes after each treatment. Also direct mist into areas where insects are present. Keep spray at least 1m from interior wall, fabrics and furniture. Spray directly on insects for fastest action. Crawling Insects: Cockroaches, Ants, Spiders, Silverfish, Crickets, Centipedes and Carpet Beetles. Spray THOROUGHLY into hiding places such as cracks, crevices, openings around sinks, drains and pipes, under refrigerators, baseboards, moist areas, behind cabinets and storage areas. Ants: Spray ant trails, around door sills, window frames, or in ant nests. Insects must be hit to be killed. Bed Bugs: Spray mattress lightly, particularly around seams and tufts. Take beds apart, spray bed frame and springs including all joints. Repeat as required. Control Fleas and Brown Dog Ticks: Spray infested areas such as pet’s bed and resting quarters, nearby cracks and crevices, along and behind baseboards, window and door frames, and localized areas of floor and floor covering where these pests may be present. Remove old bedding after treatment. Insects must be contacted to be killed. Do NOT use on pets. Pests on Ornamental Plants: For control of Aphids, Two-spotted Spider Mites and Adult White Flies on the following plants: African Violets, Aralia, Christmas Cherry, Chrysanthemum, Cineraria, Diffenbachia, Fuschia, Gloxinia, Ivy and Neathe Bella Palm. Spray when insects are noticed with a slow sweeping motion so that mist drifts on upper and lower leaf surface. Use with caution on new growth and tender foliage. Repeat as necessary.